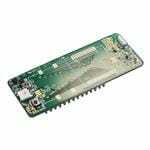 Reference board for the L01 and W01 OEM modules (not included) from Pycom. The board has an on board button, WS2812B Tri-Color LED, Chip Antenna, and U.fl connection for working with everything you might use one of the OEM Modules for in a breadboard friendly form factor. It’s a simple way to prototype your next project/product using the Pycom OEM modules which are suitable for volume usage. Please Note: This board is not compatible with the L04 or G01 modules. U.FL connector for the L01’s LoRa output. On-board 2.4GHz antenna for WiFi and Bluetooth, with the ability to switch to a external antenna via a U.FL connector.